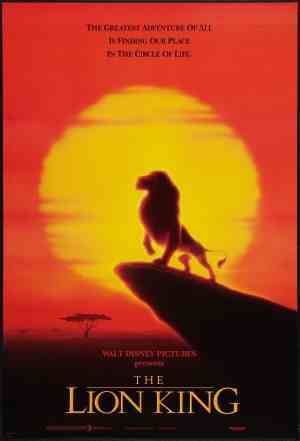 Does one of the greatest Disney films still roar louder than the competition twenty years on? When the great lion Mufasa is murdered by his brother Scar, the heir to the throne, Simba, escapes the land and makes friends with two oddballs in a tropical jungle. When Simba grows up and becomes a strong and powerful lion himself, he must make a choice to face Scar or continue living in paradise. Most Disney film’s with royalty involve a prince or princess, and focus mostly on romance, but this is where The Lion King largely differs. The main lion characters are full of bravado, and with a throne up for grabs the film becomes much more epic than even a lot of live-action films can manage. This is to its credit as it utilises this type of story by focusing on grand moments like Simba being shown to the kingdom for the first time, King Mufusa talking to his son about a King’s responsibility, or the beautiful vision of Mufusa in the sky guiding Simba on what to do. The film’s epic tone isn’t even dampened by the songs, with this being arguably the last truly great Disney sing-along movie. There have been many more since 1994, but none have had so many great, catchy and, more importantly, memorable songs like I Just Can’t Wait to be King, Hakuna Matata and Can You Feel The Love Tonight. What’s more, the film blends these songs into the story better than a lot of its contemporaries, with fun and quick paced songs that keep the audience entertained instead of acting as a very obvious interlude. Not only do they reinforce the story, they also entertain and keep you humming long after the credits roll. But it’s not just the songs that still impress; the animation has endured too, proving to be beautiful by using stark contrasting colours of vivid greens and oranges when the kingdom is at its most glorious, and dark gloomy greys and blacks when it’s in descent. The film manages action scenes surprisingly well too, considering it was made in 1994, the animated scenes of wildebeest running at full pace, and slow motion fights between lions still look fantastically impressive and grand in scale. The Lion King still looks fantastic and is a nice change from the usual CGI offerings of today’s animated contenders. But with a grand scale, great songs and a story that entertains from the very opening shot to the last, this becomes a must watch for all the family.